Four-color DNA sequencing with 3â€²-O-modified nucleotide reversible terminators and chemically cleavable fluorescent dideoxynucleotides. Guo et al. PNAS July 8, 2008 vol. 105 no. 27 9145-9150. Four-color DNA sequencing by synthesis using cleavable fluorescent nucleotide reversible terminators. Ju et al. PNAS December 26, 2006 vol. 103 no. 52 19635-19640. Design and synthesis of a 3â€²-O-allyl photocleavable fluorescent nucleotide as a reversible terminator for DNA sequencing by synthesis. Ruparel et al. PNAS April 26, 2005 vol. 102 no. 17 5932-5937. Design and Synthesis of a Photocleavable Fluorescent Nucleotide 3â€˜-O-Allyl-dGTP-PC-Bodipy-FL-510 as a Reversible Terminator for DNA Sequencing by Synthesis. Meng et al. J. Org. Chem., 2006, 71 (8), pp 3248â€“3252. Four-color DNA sequencing by synthesis on a chip using photocleavable fluorescent nucleotides. Seo et al. PNAS April 26, 2005 vol. 102 no. 17 5926-5931. Turritopsis nutricula is jellyfish that can develop back into a polyp from the jellyfish form, with cells differentiating from adult cells types to polyp types. This is quite unusual, only known to occur in a few jellyfish species. This reversion to an immature form may allow it to become effectively immortal, renewing itself by passing through the polyp stage again. 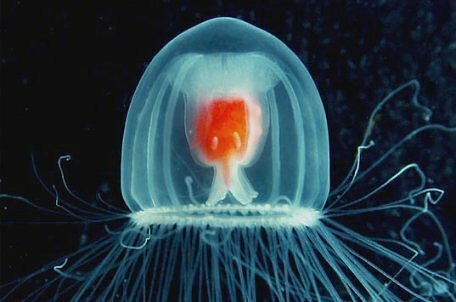 The ‘effectively immortal’ aspect hasn’t been examined–no one has followed one of these jellyfish through multiple jellyfish-polyp-jellyfish cycles or observed cycling jellyfish living longer than they otherwise would. That is, the reversion to the polyp state may have this effect but it hasn’t been demonstrated yet. Articles describing this are getting linked around, but the research was first described in 1996. And this phenomenon has now been described in a couple jellyfish, and is not unique as the articles say. This article has lots of good pictures. This link to Development Biology, 8th ed. by Scott F. Gilbert has good background info. Piraino et al. (1996) Reversing the Life Cycle: Medusae Transforming into Polyps and Cell Transdifferentiation in Turritopsis nutricula (Cnidaria, Hydrozoa). Carla et al.., (2003). Morphological and ultrastructural analysis of Turritopsis nutricula during life cycle reversal. Schmich et al., (2007). Induction of reverse development in two marine Hydrozoans. –Two other jellyfish that undergo reverse development. With photos.